Friends and family will take the stones with them and when they come across them at their desk or garden, they will be reminded of the departed. With “In Loving Memory” engraved on one side and the other side left blank for personalization, these memorial stones make a perfect pocket-sized token. “My special memory of you” cards are for the family to read through and treasure for years to come. Capturing memories by writing them down will help keep the memory and the essence of your loved one alive now and for generations to come. This entry was posted in Funeral favors, Funeral Gifts, Funeral Memory Table, Funeral Planning, Ideas for creating a memorial, Life Celebration Ideas, Sympathy gifts and tagged celebration of life, funeral cards, funeral ceremony, funeral favor, funeral gift, funeral ideas, funeral planning, instead of flowers, memorial favors, memorial gifts, memorial service ideas, personalize. Bookmark the permalink. 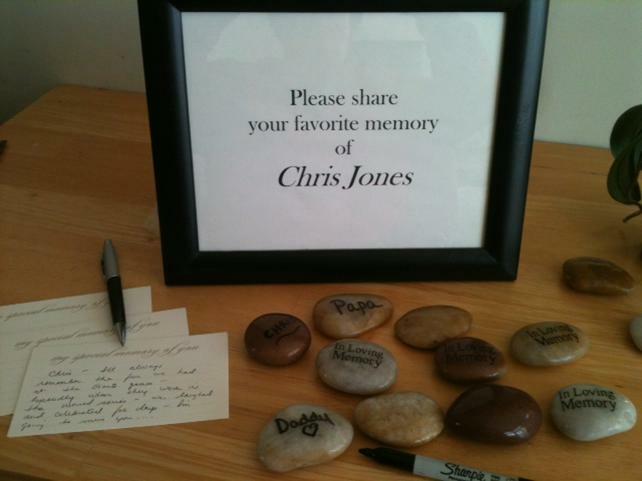 This is an excellent idea, and I have seen this used in a number of funeral services in Brisbane. I have also seen driftwood and pieces of paperbark etched with memories. Very meaningful.